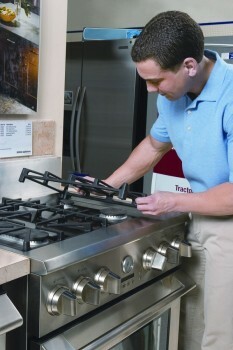 General cleaning should be done to your stove and oven a few times a year, and for sure after a big spill. But there are also some other things you can do to ensure that your stove’s cooking elements last longer. For instance, we suggest never placing aluminum foil under your burner drip bowls or under your oven’s baking element. This can cause the stove’s burners to short out. Instead, we recommend replacing the drip pans with new ones when the old ones become dirty. Elements will work more efficiently because they will reflect more heat energy towards the pan and that will result in better cooking on your end. When spills do get into those drip pans, be sure to use cleaners that are applicable for your stove surface. For instance, you wouldn’t want to use an all purpose cleaner on a glass top stove. Read directions on the stove cleaner you’ve chosen and wear rubber gloves to protect your hands as some can be quite strong on the skin. If your stove has tough grease or food stained spots that just won’t come off, try using a nylon brush or scrubber, but avoid using harsh abrasive cleansers or steel wool that may leave scratches. For more tips on how to ensure that your appliances are getting proper maintenance, visit www.scratchanddent.ca or stop by the store at 407 Gage Avenue, Unit #4 in Kitchener. A friendly staff member would be happy to help you or take your questions at 519-743-3623.